In 1977, George Lucas reinvented all the rules of movie-making, relaunched the special effects industry, re-calibrated audience expectations and re-imagined the potential for film profitability. Star Wars, as it was simply known upon its release, is one of those rare films that stands as a gigantic landmark in the history of cinema. In terms of movie franchises, science fiction, special effects, sprawling epic stories, and movie merchandising, there are two eras: before Star Wars, and after Star Wars. Star Wars turned out to be the fourth episode in what would become a multi-part movie series that spanned decades, and generated countless books, video games, TV series, and an entire collectible toy sub-industry. Star Wars also launched the career of Harrison Ford, who went on to become one of the biggest Hollywood stars, and re-ignited interest in space-related movies and television series. The impact on culture was to be equally deep and long-lasting. The Force, warp-speed, holograms, Jedi Knights, the Death Star, Darth Vader, R2-D2, C-3PO, light sabres, and the term "Star Wars" itself all became integrated into everyday life and far transcended their humble movie origins. The success of Star Wars is rooted in the creation of a vast, original, and complex galaxy (both figurative and literal), but weaving onto it a simple story of a farm-boy who must rise to fulfill his destiny in a strange world. The farm-boy is of course Luke Skywalker, who stumbles onto a holographic message hidden within the robot R2-D2 by Princess Leia. The Princess is aiding the fledgling rebellion against the evil Empire, and she needs the help of Obi-Wan Kenobi. 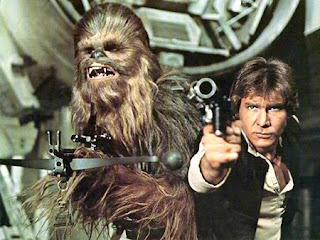 Luke soon finds Obi-Wan, and they team up with the smuggler Han Solo and his side-kick Chewbacca, a Wookiee, to rescue the Princess, who is in the clutches of Darth Vader. Luke and Han free Leia while Vader duels with Obi-Wan. Although Vader wins the light sabre battle, Obi-Wan becomes "one with the Force" and gains the ability to help Luke from the beyond. And help will be needed as the rebels and Luke attack the fearsome Death Star in an epic space battle. In addition to spectacular visual and sound effects and the majestic John Williams music score, Star Wars included several scenes of astounding originality that became instant movie classics. Among them the cantina scene on the planet Tatooine, the garbage compactor trap, the Millennium Falcon jumping to warp-speed, and the final attack on the Death Star. And in the character of Darth Vader, Star Wars introduced one of the most fearsome and menacing movie villains, and also one of the most famous and loved film icons. In front of the screen, Harrison Ford as Han Solo, Mark Hamill as Luke and Carrie Fisher as Princess Leia are all watchable and engaging, and they benefit from relatively sharp and witty dialogue that Lucas would unfortunately not match again in future entries. Star Wars is helped enormously by the sheer presence of Sir Alec Guinness who sparkles as Obi-Wan Kenobi and lends substantial weight to the story and the unfolding action. Star Wars only gets better with age, and now that future parts of the story have been told, it shines ever more brightly as the foundational chapter in the most remarkable space epic ever put to film.